Departing from Barwon Heads Airport, this experience will give you uninterrupted views and an amazing ride. A helicopter is the best way to get a great view of the surrounding coastline Barwon Heads. 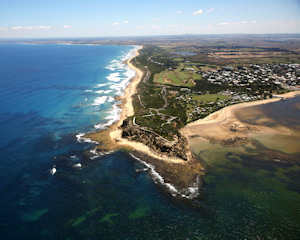 This 7 minute flight is the perfect way to view the beautiful Barwon Heads coastline from the air. Departing from Barwon Heads Airport (only 20 minutes from Geelong), This experience will give you uninterrupted views and an amazing ride. A helicopter is the best way to get a great view of the surrounding area, and on this flight let us show you the sights around Barwon Heads and Ocean Grove. This flight is based on 2 people in a Robinson R44 Helicopter that seats up to 3 passengers, all guaranteed window seats for perfect views. This flight is for anyone who wants to enjoy a eagle eye view of the beautiful Victorian Coastline. Maximum weight of 130kg for any one person and total maximum weight of 235kg for all passengers applies. Itinerary and routes of flight may need to be varied, dependent on weather and operational conditions on the day. I would highly recommend it!! Staff were amazingly friendly, such amazing people, they went out of their way to make sure your flight was one to remember! Could not recommend them enough ?? Just want to thank you for a great experience and wonderful service of both your staff over the phone who assisted with booking with my vouchers. Also the staff from Geelong Helicopters really made the difference! Have already recommended this experience to family and friends. Will most likely be back again at some stage! It was fantastic but shattered i didnt go for a longer flight, perfect day for flying and our pilot was just perfect. Great experience and the boys were great!! I booked the helicopter flight in the morning without fuss, and was able to take my kids on the flight on the same afternoon. A great thrill for everyone, which we will remember for a long time.